presentation to Senate Education, Culture and Sports Committee in Brasilia, Wednesday October 26, 2011. Good morning. Thank you for your invitation. I have been an investigative reporter for 45 years. I research and acquire confidential documents. Then I write books and articles and make investigation films for the BBC. I have been investigating FIFA for 10 years. I have considerable experience in investigating organised crime and I can assure you that FIFA ticks all the boxes in the academic definition of an Organised Crime Family. Today I want to tell you about the latest corruption crisis at FIFA and how it will impact on the 2014 World Cup. But first – Meet some of the members of FIFA’s 23-man Executive Committee. # Jim Boyce is Britain’s vice-president. He is silent about corruption. He can expect to pocket around US$1 million in FIFA payments in the next 4 years. # Prince Ali from Jordan. A lightweight. Put in place by Blatter to get rid of one of his critics. # Worawi Makudi from Thailand has been named in several FIFA scandals and is currently under investigation for misuse of FIFA development money. # Manilal Fernando from Sri Lanka is under investigation for his possible involvement in the notorious US$1 million vote-buying scandal set up Qatar’s Mohamed Bin Hammam in Trinidad in May. # Nicolas Leoz from Paraguay, at left, president of Conmebol. Swiss court documents reveal he took US$ 730,000 in bribes from the former FIFA marketing company, ISL. Blatter refuses to investigate. 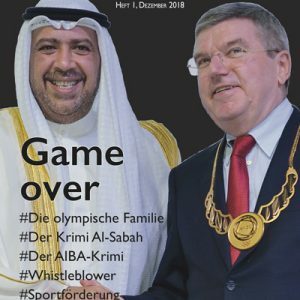 Korruptionsbilanz in FIFA und IOC: 140.785.618,93 CHF. Mindestens. I will have more to say about Mr Teixeira later. # Chuck Blazer from New York. For the last 21 years Blazer and Jack Warner looted the Confederation of Central, North American and Caribbean countries. Chuck Blazer’s Caribbean bank accounts are now being examined by the FBI. Mr Blazer’s testimony is rejected as fabricated. FIFA paid MasterCard US$90 million to settle the case. # Rafael Salguero from Guatemala was nominated by the now discredited Jack Warner. I won’t repeat the allegations about Mr Salguero! This is the biggest scandal ever at FIFA. 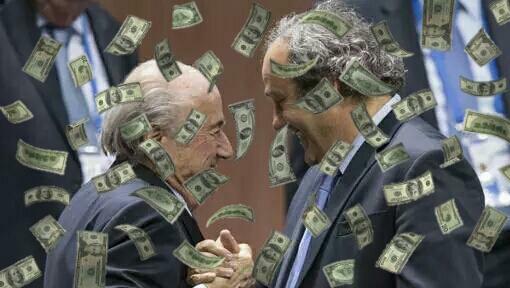 It’s the payment of bribes to FIFA officials by the ISL sports marketing company in return for World Cup contracts. It is currently making news in Brazil – and globally. Let’s introduce this saga through some of the activities of FIFA General Secretary Jerome Valcke. In early 2001 Valcke worked for a French company hoping to buy the assets of the bankrupt ISL company. His team examined the ISL books. He discovered the massive, secret kickbacks to FIFA officials. Two years later Blatter hired this ‘blackmailer’ to be his new head of marketing! You might wonder, why? 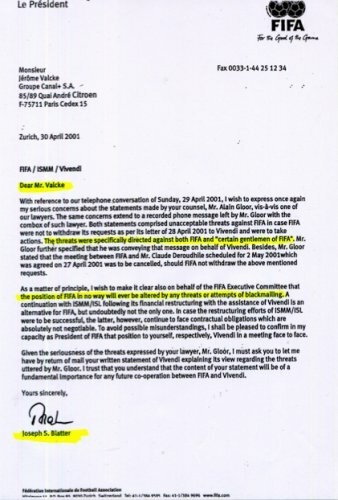 Like Chuck Blazer, Mr Valcke also gave evidence in the MasterCard case. 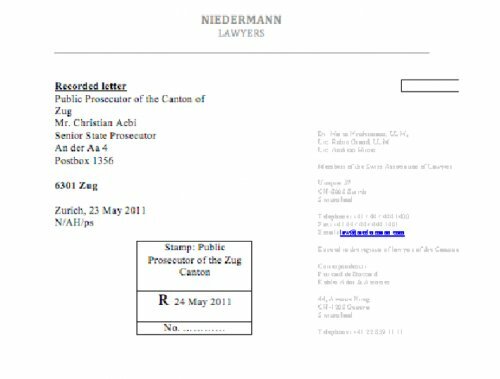 Their lawyer Mr Martin Hyman accused Mr Valcke of lying. Disraeli once said there were three kinds of „lies, darned lies and statistics. “ We have learned from the FIFA Marketing Group that there are more. We have learned about the six degrees of prevarication, white lies, commercial lies, bluffs, pure lies, straight untruths and perjury. Mr Valcke even lied when testifying about his lies. But in FIFA’s world, that’s perfectly okay. That was in December 2006. It was an international scandal. Sepp Blatter announced that Jerome Valcke was fired! Six months later Blatter brought him back … promoted to be FIFA General Secretary! Again – what hold does the blackmailing Valcke have over Blatter? 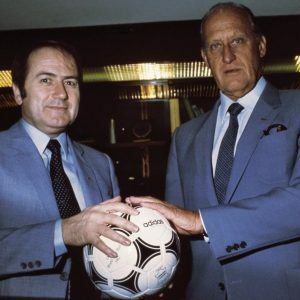 The ISL contracts-kickbacks story began in 1974 when German businessman Horst Dassler paid bribes to get Joao Havelange elected president of FIFA. Mr Dassler, from the family who owned Adidas, created the ISL company and wanted FIFA’s lucrative World Cup contracts. Did Havelange put his hand out for money? Or did Dassler offer the bribes? Who made the first move? Mr Havelange could tell us. Horst Dassler died in 1987. Havelange remained FIFA president, Sepp Blatter was his General Secretary. In between them, here, is Jean-Marie Weber, formerly Dassler’s assistant, who became notorious as the ‘Bagman’ who delivered the ISL bribes. He admitted this in court in 2008. A key player in the conspiracy to privatise the people’s sport was IOC president Juan Antonio Samaranch. One of the IOC’s dirty secrets is the 37-year fascist history of Samaranch, former sports minister for Franco. There he is with his arm up, fourth from right. Samaranch and Dassler worked together to deliver sport to the sponsors. In 1996 the American IMG company tried to break ISL’s monopoly on FIFA contracts. IMG offered US$1 billion for the rights to the 2002 World Cup. They soon discovered FIFA General Secretary Blatter and President Havelange were lying to them. FIFA double-crossed IMG, ISL got the business and Blatter and Weber got closer. 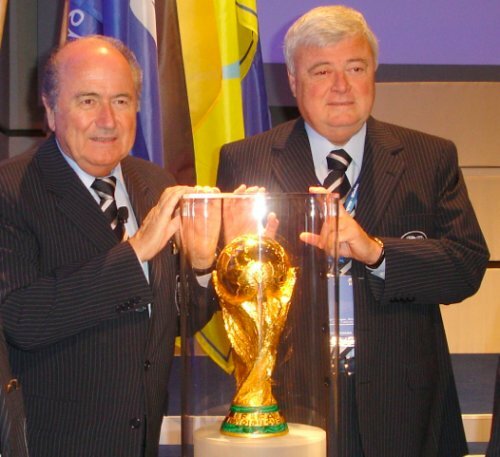 Here’s Sepp Blatter in 2004 with “The Bagman” – Jean Marie Weber. 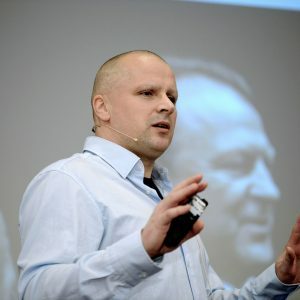 From 2001 ISL, Weber, Blatter and the bribe-takers were investigated by this man – Investigating Magistrate Thomas Hildbrand. FIFA and Blatter did all they could to obstruct him. In 2006 the BBC were investigating the ISL bribery scandal. We sent emails to Blatter requesting an interview. So we went to see him. We caught up with him on a public footpath near the old FIFA House on the day of a FIFA press conference. I have been banned from FIFA since 2003 when I published a documented story revealing that Blatter pays himself a huge, secret, annual bonus. JENNINGS: Please can I come into your press conference? I said please may I come into your press conference? AJ: May I come in? AJ: But some of your press people won’t always let me in. BLATTER: I will take care of it. Okay? AJ: I just want to put a question to you now because some of your press people don’t let me get in, they bar me. BLATTER: You come with me. AJ: Let me just ask you this, do you know which football officials took bribes from the ISL Marketing Company? BLATTER: Sorry, I don’t speak about that. AJ: Do you know which football officials took payments from the ISL Marketing Company? AJ: Have you tried to find out who took these payments from the ISL Marketing Company? BLATTER: You know better than I know, you know better than I know. AJ: You’re the president of world football, I’m only a reporter. AJ: Will you tell me who took the 1 million franc bribe? … I’m told you ordered this bribe should be moved to the man who’s name is on the payment, can you tell me who it went to, was it President Havelange? As soon as we stopped filming he refused me entry to his press conference. Two years later I was at the courthouse in Zug. Six ISL executives were accused of trading while insolvent. The judge confronted Jean-Marie Weber: Did ISL pay around US$100 million in bribes to sports officials? For years I’ve been gathering evidence about corruption at the highest levels within FIFA. But there was one crucial document I couldn’t get hold of. Then just over a month ago a trusted source delivered the goods. 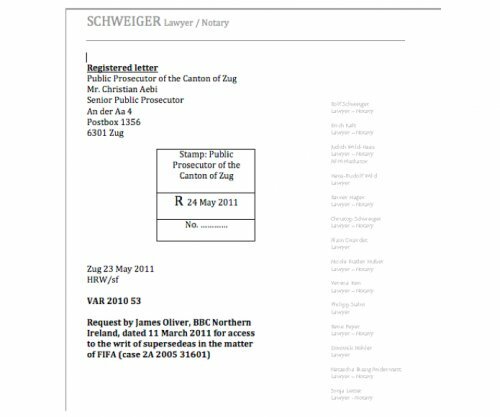 It’s a secret document, which some people at FIFA hoped could be kept buried forever. Line by line it details 175 secret payments, totalling tens of millions of dollars. I know from well placed sources that the payments were bribes. Among the list of names. Some senior FIFA officials. This is real money, massive kickbacks on World Cup contracts. Havelange owes a lot to Blatter. On March 3 1997 ISL made a terrible mistake. They sent a bribe for 1.5 million Swiss francs – around US$1 million – intended for President Havelange – direct to FIFA’s bank account! FIFA general secretary Sepp Blatter ordered the money transferred quickly to a Havelange private account. He denies it ever happened. How much did FIFA president Joao Havelange take in bribes? My guess is in excess of US$50 million. Did he pay tax in Brazil on this money? I will now move on to 3 other cases of bribes paid to FIFA officials. The BBC sent each man at least 2 emails inviting them to grant interviews. They did not respond. 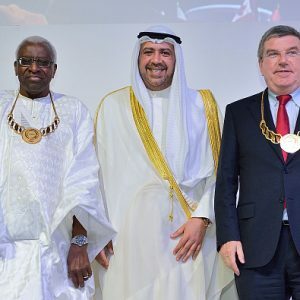 One of them is Issa Hayatou – well known to “The Bagman” Jean-Marie Weber. This is from my film of November 29 last year. Mr Hayatou is a FIFA Vice President representing fifty-three African countries. The list shows ISL paying him 100,000 French Francs. He didn’t answer our letter either. This time I got a bit closer. Mr Hayatou. Andrew Jennings we’ve met before. Could you spare me a moment? I’d like to ask you about monies. We’ve looked. The ISL books show that you received money from the ISL books. That’s what the lists say. They say you received money, Issa. Your name is in the books from ISL. Your name is in the books for getting money that is why I am asking you. Then there’s Nicolas Leoz from Paraguay. 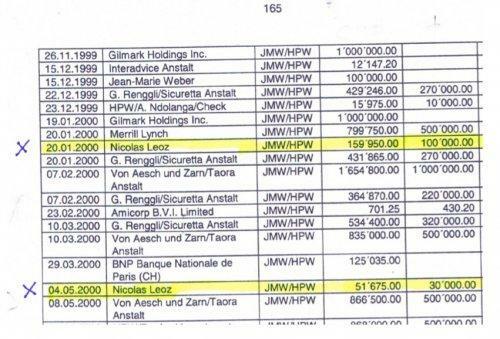 In court in Zug in 2008 we were told that he had received US$130,000 from ISL in the year 2000. 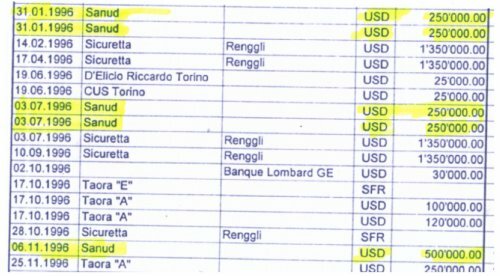 Thanks to this secret list of payments we’ve obtained, never revealed in open court, we can see that Mr Leoz got a great deal more. The ISL list shows he received three further payments. One of two hundred thousand dollars. Another one of two hundred thousand. We wrote asking him to explain the payments. He didn’t respond so I tried to catch up with him at a luxury hotel in Zurich. Senor Leoz, senor Leoz. Did you take bribes from the ISL company? Senators – you will remember that in 2001 you published your report of an investigation into Ricardo Teixeira and the CBF. You discovered that Teixeira and his company were receiving money from a company in Liechtenstein named Sanud. Here’s a random page from that report. I understand that your investigation could not find out where Sanud got its money from. I discovered that Sanud’s money came from the ISL company. In November last year I caught up with him. 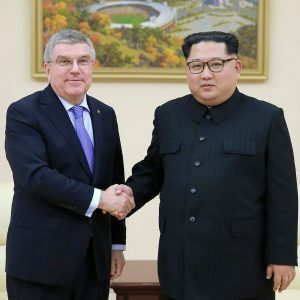 This is what the world has watched. JENNINGS: Here’s another Liechtenstein company, named Sanud. It got 21 payments totalling 9.5 million dollars. This time there are some clues about who got the money. They point to the most significant person linked to our secret document. He’s another member of FIFA’s executive committee. And the man in charge of the next World Cup, in Brazil in 2014. In 1998 we tried to ask him about his role in sponsorship deals for Brazil’s national team. You don’t want to talk about football. No more answers. No more questions. Bye, bye. But we’ve got new questions, because that Liechtenstein company, Sanud, has been closely linked to him in the past. 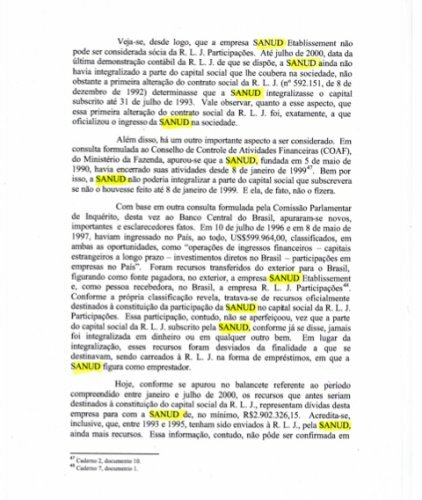 An inquiry by the Brazilian senate in 2001 found that funds from Sanud had been secretly channeled to Mr Teixeira. So did the 9.5 million dollars on our list end up in his pocket as well? We wrote to Mr Teixeira and asked. He didn’t reply either. Hello Mr Teixeira. Could we talk to you please? So I went back to FIFA’s hotel in Zurich to ask him. Did you take your bribes through the Sanud company? What were those payments from the ISL company for? Who were the accused? They are Blatter, Teixeira and Havelange. They have paid a small fortune to have their names kept secret. But they cannot. The BBC and several Swiss newspapers are fighting a legal battle to have Hildbrand’s report published. 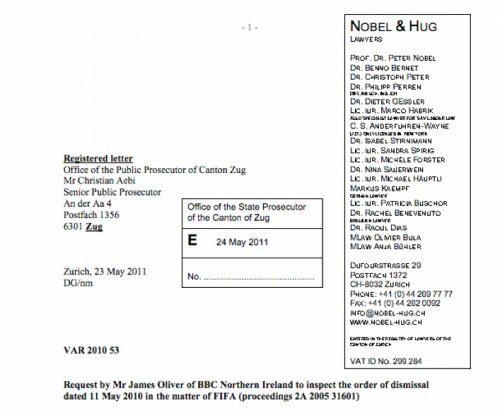 Blatter, Havelange and Teixeira are resisting – and here are the Swiss lawyers for clients B1, B2 and B3. I know this because the BBC receives copies of all correspondence. B3 is Joao Havelange, represented by law firm Niedermann. 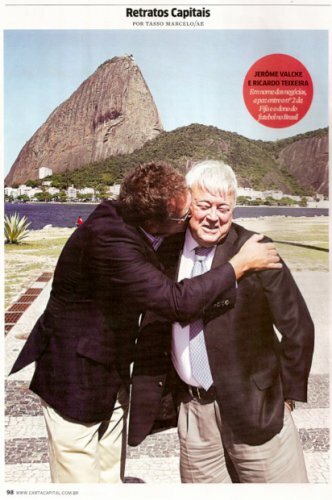 Last week the Public Prosecutor in Zug rejected the arguments of Blatter, Teixeira and Havelange. The big question now is: Will Blatter, Teixeira and Havelange continue to fight for suppression? Our lawyers say it is inevitable that the Swiss Supreme court will order disclosure in the public interest – although it may take another 12 months. Then you will have a massive international scandal hanging over your world Cup. Two Brazilians and President Blatter. Außerdem halte ich die Kritik für übertrieben. Ralf, müssen wir nochmal dazu sagen, dass es der fachlich versierte MdB Klaus Riegert (CDU/Schwäbischer Turnerbund) ist, der die Kritik an der FIFA (fachlich) für übertrieben hält? Ist das das erste Mal, dass Blatter himself mit den ISL-Zahlungen in Verbindung gebracht wird? Nein. Wir wissen das schon länger. Für meine TV-Dokumentation „The Untouchable“ beispielsweise haben wir ihn Anfang 2004 im Doppelpack befragt: In Tunis beim CAF-Kongress und kurz darauf bei ihm zu Hause in Zürich. 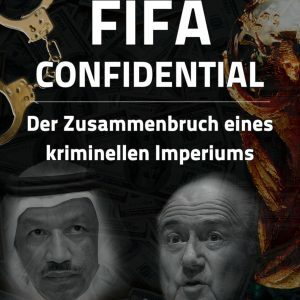 Diese beiden Szenen fehlen seither in kaum einer Blatter-Dokumentation, sind im deutschen und schweizer Fernsehen etliche Male eingebaut worden. 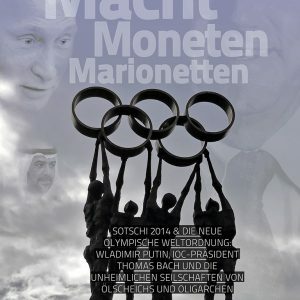 Das interessiert nach vielen Jahren und Dank AJs Hartnäckigkeit nun auch die IOC-Ethikkommission. Ich sach ma korrekt: das Interesse hält sich in Grenzen. @5. Das ändert sich so langsam. Ganz langsam. Nicht in den Medien, deren Entscheidungsträger ihre Jobs und spoils ja dem Sport auch verdanken. Aber die verlieren eben das Momentum und wenn die Dynamik einmal ausgelöst ist, weiß keiner, wo sie endet. Siehe der arabische Frühling. Vielleicht kommen die Schweizer Gerichts-Dokumente ja bald raus. # 6, Johan Petersen: Das denke ich auch. Ich persönlich habe den Fifa-Präsidenten immer als einen Menschen erlebt, der sein Wort hält. Also nie so, wie er oftmals in der Öffentlichkeit dargestellt wird. Deshalb baue ich auf seinen Reformwillen. Es wird natürlich immer Menschen geben, die ihr Bild von Blatter nicht verändern wollen und werden. Aber es gibt glücklicherweise mittlerweile auch einige, die zu denken beginnen, dadurch ihre Feindbilder abbauen und den Blick nach vorne richten. 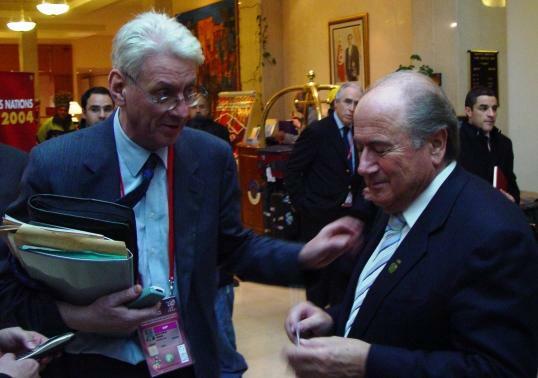 Thomas Hildbrand discovered enough evidence to prove that 2 FIFA officials took ISL bribes – and that Blatter had covered it up. Nö. Nicht persönlich. Jedenfalls nicht, dass ich wüsste. Eine Frage – die haben wir immer wieder gestellt – war aber, wer das ISL-Schmiergeld (eine winzige Summe) einst vom FIFA-Konto an Havelange weiter geleitet hat. Havelange owes a lot to Blatter. On March 3 1997 ISL made a terrible mistake. 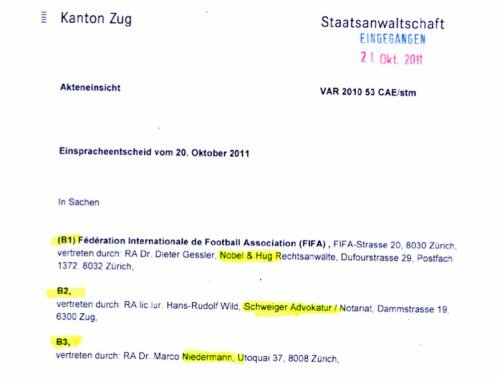 They sent a bribe for 1.5 million Swiss francs – around US$ 1 million – intended for President Havelange – direct to FIFA’s bank account! Now there’s the official opinion! Subject: CBF 03 – OMBUDSMAN BRAZILIAN CHAMPIONSHIP – Fan RESPONSE Re: A picture is worth a thousand words! ENVIRONMENTAL NOTE: Do not print this document before reading the content. Save paper, ink and energy. Ricardo Terra Teixeira, President of CBF, Opening Seminar of the Brazilian Championship in 2008, São Paulo, May 6, 2008. EDT – STATUS OF DEFENSE Fan: Law No. 10671 of 15.05.2003. Fan STATUS OF DEFENCE: THE CITIZEN AND THE LAW SOCIETY. RESPECT, promote, participate! The views and comments of the Ombudsman of CBF – Brazilian Championship is your full and exclusive responsibility and do not necessarily reflect the position of any officer of the CBF, because its board has no prior knowledge nor has any kind of censorship on the comments of Ombudsmen. The Ombudsman of the Brazilian Championship and the Cup of Brazil are technically subordinate to the DCO – Director of Competitions CBF [former DTE – Technical Department]. Thank you for your query to this ombudsman, as the devices to Law No. 10,671, of 15/05/2003, which established the EDT – Status Defense Fan. Although the Ombudsman had 30 days to respond to emails and letters from fans EDT, [Article 6, paragraph 2. Item II], we respond immediately, as recommended by the DCO – Director of Competitions [within 48 hours], which is not always possible due to the amount of messages received and / or the need of consultation with the CBF, or research data and detailed reading of the legislation and regulations. All messages are answered and are recorded in reports submitted to the DCO of the Ombudsman for formal knowledge and adoption of appropriate measures when necessary. SPORT, BRAZILIAN CHAMPION 1987! – Was, our captain, lifting the cup cookies. Trophy Room of the Sport Club do Recife. Zico and the cup that belongs to Flamengo: Styrofoam beads. 1) We received your message and thank you for your attention. 2) The CBF official news released on 14/04/2010 on the final decision regarding the Champion of Division 1 of the Series A = Club Championship, 1987 and related matters on the Cup balls [CEF Trophy Cup Brazil] and Union World Cup 1987 , reconfirming the position of the entity and previous information sent to the standard response by fans of the Ombudsman. Thank you for your interest and if you need to contact me again. Ombudsman Football CBF [since June 2003] – Serie A 2007/2010. The CBF, by advice of its Legal Department, decided that it is up to São Paulo Futebol Clube final possession of the representative of the Brazilian Championship trophy, named in Regulation, Article 4, Brazil Cup (Cup balls). The opinion of the Legal Department took into account the Regulation of the Brazilian Championship of 1987, which was attended by 32 clubs, divided into two keys, called Module Module Green and Yellow. Regulation in its Article 6, paragraph 2, provided that the champion and runner-up of each module would compete in a quadrangular, the titles of champion and runner-up Brazil in 1987 and qualifying for the Libertadores Cup 1988. At the end of the championship, were ranked at Green Module, Flamengo and Internacional, and the Yellow Module, Sport Club Recife and Guarani, which made the CBF, in compliance with Regulation, mark the four games between the clubs. Flemish and International refused to play the games described, won by forfeit being declared, and finally the Sport has won the Brazilian champion of 1987, a result disputed by Flamengo and Internacional, without these two clubs present reasons consistent. Thus, in the board meeting held on May 23, 1988, CBF, through its president Octavio Pinto Guimaraes, proclaimed the Sport and the 1987 Brazilian champion Guarani, vice, while appointed as representatives of the two clubs in the Libertadores Cup of America in 1988, what actually happened – Sport and Guarani competed in the Libertadores Cup 1988. Nevertheless, the controversy persisted, which led to join the Sport in court, seeking judicial appointment declare that Brazilian champion of 1987. The club Pernambuco was victorious, as the Honorable Superior Court, in judging the Interlocutory Appeal No. 210691 on March 10, 1999, confirmed Judgement of the Federal Court of the 5th Region that had kept the sentence of the first degree who had gain because the Sport. As shown, with Brazilian champion of 1987, the Sport, not Flemish, it is then up to the final possession Sao Paulo Brazil Cup trophy for being the first club to win the national championship five times alternately (1977, 1986, 1991 , 2006 and 2007). The decision was announced after the Annual General Meeting of the CBF, held on Wednesday, which unanimously approved the Activity and Financial reports of the entity in 2009. 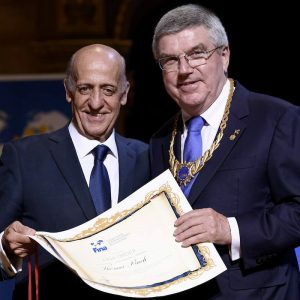 The president Ricardo Teixeira presented the trophy BRAZIL COPA, a date to be checked, the president of the Paulista Football Federation, Marco Polo Del Nero, who forwarded it to Sao Paulo. · Full transcript of the original 03 pages available on the CBF [italics, underline, color and highlights in bold are not on the original version. The President of the CBF, Dr. Ricardo Terra Teixeira requested the examination, in a matter of urgency, the question on the final possession of the Brazil Cup, a trophy representing the national championship, before the notorious controversy raging about the claims and the CR Flamengo São Paulo Futebol Clube. It is well known and old dispute, but that, in our view, involves very simple solution. The fact is that the Regulations of the Brazilian Championship of 1987, 32 clubs participated in the 1st division in two keys, called Module Module Green and Yellow. In art. 6, paragraph 2, the regulation provided that the Champion and Vice Champion of each module would compete in a quadrangular, the titles of Champion and Brazilian Vice-Champion 1987, and qualifying for the Libertadores Cup, to be held next year. It is inevitable therefore that there would be at the end, the same or intersection of the two best placed (and Vice Champion) of each module in a single race. In the end, found that were classified at YELLOW Module, Sport Club do Recife and Guarani Futebol Clube; By GREEN Module, is rated the Club de Regatas do Flamengo and Internacional. Finally, the Sport has won the Brazilian Champion of 1987. This result was widely disputed by CR Flamengo and the International, but no consistent reasons. Thus, the CBF Board meeting held on May 23, 1988, issued a unanimous resolution is based on the opinion of the Legal Department, to proclaim the Sport Club of Recife as Brazilian Professional Football Champion 1987 and Guarani Futebol Club of Campinas, as Vice-Champion of the same course. At the same time, these two clubs have been officially designated to represent the CBF in the running of the Cup „Libertadores“ of 1988, as actually occurred. Nevertheless, the controversy persisted, prompting the Sport Club of Recife to join in court, seeking judicial appointment declared champion of the Campeonato Brasileiro 1987. Once again, the Sport Club do Recife was victorious because the E. Superior Court of Justice, the judge Interlocutory Appeal No 210. 691, on March 10, 1999, confirmed the ruling of the Federal Court 5th Region that will in turn, had maintained a sentence for first degree because he had won the club. The conclusion inevitably is that the Club de Regatas do Flamengo champion in 1987 was not, contrary to insist that their supporters and followers. b) S. Paul F. Club – became champion championships in 1977,1986,1991,2006, 2007 and 2008. As shown, the first club to win Serie A p five times, alternately, was the Sao Paulo Football Club, who completed this requirement in 2007 while the CR Flamengo only got the 5th title in 2009. Therefore, it is up to St. Paul F. C. CR Flamengo and not the permanent possession of the trophy known as „Cup Brazil“ (Cup of balls). Just answer the question that made me the President of the CBF. Ist doch bloß eine kleine Abwechslung zum ansonsten überstressigen Parlamentarierjob. Der internationale Blick wird außerdem geweitet, um zu sehen, wie gut bei uns doch alles läuft. Dabei auch noch ressortübergreifende Aufgaben zu übernehmen, ist mehr als löblich. Also ich bin zufrieden, wenn sie mal ein bißchen unterwegs sind. Und Sparen ist sowieso in diesen Zeiten lediglich mittelbare Pflicht des Parlaments. Zwar OT, passt aber hierzu. Die gestrige Meldung, dass Ex-FM Eichel gegen die Stadt Kassel wegen seiner ausstehenden Pension als OB in Höhe von ca. 6.500 EURO klagt, zeigt die herrschende Genügsamkeit der Polit-Nomenklatura. Eichel erhält bislang nur 8.200 EURO aus seines Jobs als Ex-FM und Bundestagsabgeordneter. Sorry for the missprint, natürlich sind das MONATLICHE Bezüge. Und wer nimmt nun die anstrengende Rundreise auf sich? Das steht noch nicht ganz fest. Ein paar Abgeordnete, heißt es, hätten abgesagt. Gut gemacht, Andrew & Friends! Interesting to read you. As I can see you are as well interested in sports politics. Recently I red the speach of Matt Ridley to the RoySocArt. Did you?